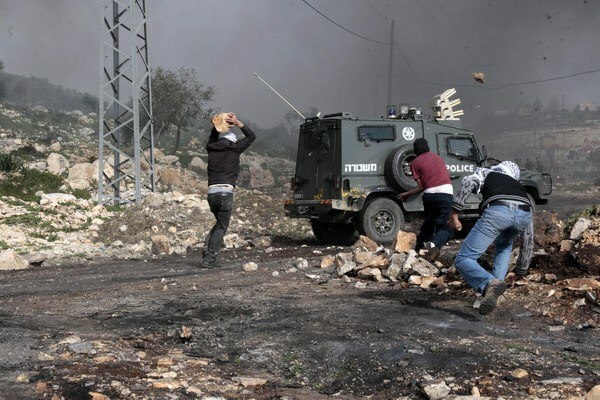 Dozens of Palestinian citizens, this morning, were injured in Israeli attacks on a demonstration commemorating the 39th Land day, in Huwwarah town, south Nablus. Activist against the wall and settlements, Abdullah Abu Rahma told the PNN that dozens of citizens, including Palestinian Legislative Council member Walid Assaf, suffered teargas inhalation, in addition to being pepper sprayed. Abu Rahma added that a number of the injured were treated on the spot, while others were moved to Rafidia hospital. Palestinian people, from the river to the sea, today, partake in the annual Earth Day (Land Day) celebration, and demonstrate against the confiscation of what is now more than 21 thousand dunums of land. The day has been in memory on the 30th of March since 1976, when Israeli forces killed six Palestinian demonstrators on the same day. On the occasion of Land Day, the Palestinian Central Bureau of Statistics (PCBS) published a statistic showing that Israeli occupation now controls more that 85% of historical Palestine. Israeli occupation authorities demolish Palestinian houses and impose obstacles and constraints on building licenses for Palestinians. According to Al-Maqdisi Institute, during 2000 - 2013, Israeli authorities demolished 1,230 buildings in occupied East Jerusalem (the areas annexed by Israel in 1967). This has resulted in the displacement of 5,419 people, including 2,832 children and 1,423 women. The estimated losses to Palestinians of the demolition of buildings in Jerusalem total around three and half million US dollars. (This does not include the large fines imposed on so-called construction violations.) Data indicates an increase in cases where residents have to demolish their own houses: 320 people have been forced to demolish their own homes since 2000. The highest rate of self-demolition was recorded in 2010 with 70 demolitions, compared to 49 in 2009. Data indicates that the total area of residential houses demolished in Jerusalem during 2013 increased in comparison with 2012. A total area of 6,196 m2 was affected during 2013: the area of non-residential establishments demolished totaled 1,150 m2. Data from Israeli human rights organizations indicates that more than 25 thousand houses have been demolished in Palestine since 1967. There were 482 Israeli locations in the West Bank (including settlements, outposts and military bases) by the end of 2013. Data indicates that the total number of settlers in the West Bank was 563,546 at the end of 2012; 277,501 settlers live in the Jerusalem governorate and constitute 49.2% of all settlers occupying the West Bank: 203,176 of them live in areas of Jerusalem annexed by Israel in 1967. In demographic terms, the proportion of settlers to the Palestinian population in West Bank is around 21 settlers per 100 Palestinians compared with 69 settlers per 100 Palestinians in the Jerusalem governorate. According to Israeli statistics, the total cultivated area in Israeli settlements in the West Bank, during 2012, was 86 km2. The majority of land is irrigated with around 50 million m3 of stolen water from the Palestinians per year. Irrigated areas cultivated by Palestinians are about 78 km2, consuming around 30 million m3 of water per year, only due to the Israeli restrictions. The areas cultivated and water consumed by settlers would provide 100 thousand job opportunities for Palestinians in the West Bank if they were able to take advantage of them. This would contribute to GDP and the share of agriculture to the economy. It would also reduce the unemployment rate. In addition, a large agricultural area is located at the borders of the eastern Gaza Strip, but cannot be utilized by Palestinians because of Israeli measures. Historical land area of Palestine reached, 27,000 km2. Israel uses more than 85% of the total area of the land, while the Palestinian comprise 48% of the total population and use less than 15% only of the land. 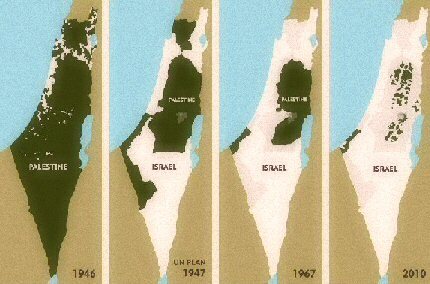 A Palestinian, therefore, has less than a fifth of the area available to an Israeli. During 2013, more than eight thousand dunums of land were confiscated from Palestinians and more than 15 thousand horticultural trees were destroyed, causing considerable damage to the Palestinian environment. The Israeli occupation authorities also approved the establishment of more than 23 thousand housing units concentrated in settlements around Jerusalem governorate, according to the annual report issued by the International Relations Department of the PLO. International law prohibits Israel from exploiting the natural resources of the occupied territories, but Israel continues regardless and treats Palestinian land as its own. Israel has taken over the management of tourist sites in the Jordan valley: Solomon's caves, Al Fashkha spring and the protected area of Wadi Al-Qilt. Israel exploits the Palestinian beaches of the Dead Sea and prevents Palestinians from developing tourism in this region by dumping wastewater and solid waste from Israeli settlements and industrial zones in these areas, according to the Israeli Information Center for Human Rights in the Occupied Territories (B'Tselem) . Occupation authorities have started to drill and explore for oil and natural gas in the West Bank to deprive Palestinians of these resources. “Neither an inch of Palestine’s territories nor a moment in Palestine’s history shall be made into bargaining chips,” Hamas vowed in a Monday statement commemorating the 39th anniversary of the Land Day. “The law of oppression is explosion; the law of occupation is gunfire; any compass that does not point at Occupied Jerusalem, with its eastern and western divisions, its soil, holy sites, and people is of no value,” a Hamas statement read. “This is the voice of one single people, believed to be scattered everywhere across the globe; the slogan of successive generations overthrowing amnesia; the trace of an unwavering and unshakable faith,” it added. “On this special day commemorating the unity of the people, of the land, and of identity . . . we pay tribute to the martyrs of the Land Day, the custodians of such fragrant memories. To our steadfast people who have been clinging to their cultural, religious, and national identity and ousting all attempts to distort, conquer, and wipe out their history. Such people are the ones that turned the dream of a Jewish state into the most outlandish of all nightmares and clutched on to their land and roots as if they were olive trees,” the group further stated. “From the midst of such a stifling siege, we carve into the rocks to assure the national factions that the day has come when the siege would be lifted, jails unbolted, return gates unlocked; Zionists will walk out of our land, shrines, and history once and for all,” it maintained. “We shall walk together in the path of resistance . . . the only route to liberation, unity and freedom,” the statement concluded. Israeli occupation forces, on Sunday night throughout Monday, have launched a wide arrest campaign targeting at least 28 Palestinians. The Palestinian Prisoners Society, on Monday, said that Israeli forces kidnapped 13 youngsters from 'Abween village near Ramallah, yesterday. According the press release, forces raided the village and a number of homes, kidnapped 13 people and gave detention threats to 14 others. 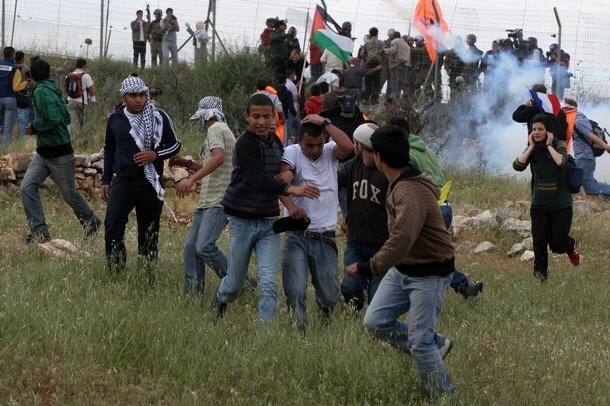 Israeli forces also handed-out threats to the villagers, in cases of any demonstrations. Monday, during the early hours, Israeli forces broke into Qaryout village, in Nablus district, stormed several homes, and kidnapped Nidal Badawi (36) after raiding his house. 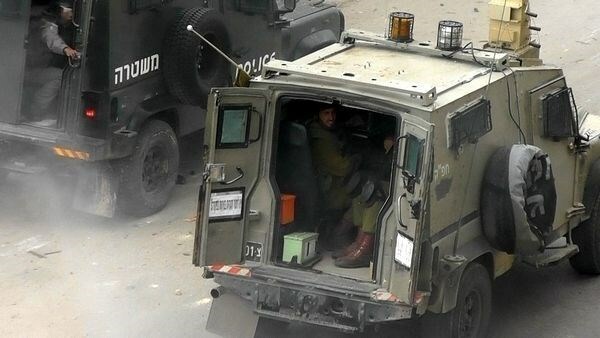 In Hebron, soldiers abducted two youngsters aged 23 and 24. In the occupied 1948, Rahatt city in the south, Tha'er Qaimari (23) sustained bruises and injuries while being chased by the IOF. Qaimari was moved to Yatta hospital for treatment. In occupied East Jerusalem, 11 Palestinians were kidnapped, including a lady. Israeli police stormed the neighborhoods of Silwan, the Old City, al-Issawiya and Shufat, where they detained Amr Abu Arafa, 28, Mohammad Rukun, 22, Fadi Ja’ba, 26, Ihab Jallad, 39, Jihad Eweda, 40, Abed Issa, 15, Amr Abu Asab, 15, Mohammad Muna, 20, and Mohammad Bseiso, 20. Meanwhile, police arrested Aida el-Sidawi, a woman who has been denied access to al-Aqsa Mosque for days. WAFA correspondence said el-Seidawi was assaulted by the police while she was protesting the decision to deny her entry to the Mosque. She was arrested and taken to a nearby police station. An Israeli army force broke into the village of Abween, north of Ramallah, where they kidnapped 13 Palestinians. Some of them were identified as Ayham Refahi, Emad Hassan, Mohammad Harb, Mohammad Tarib, Ali Najeh, Ali Hejji and Sa’ed Hejji. The army also handed summons to 14 others in the village, asking them to appear for interrogation at a nearby military compound. In the meantime, soldiers raided Hebron and took Iyad Nayroukh, 24 and Mahmoud Rajabi, 23. Israeli soldiers also set flying checkpoints in the nearby towns of Idan, Sair and Halhoul, searching vehicles and causing a traffic jam, but there were no reports of arrests. In Jenin, the military also abducted 21-year-old Ashraf Sheta, after raiding and searching his house. 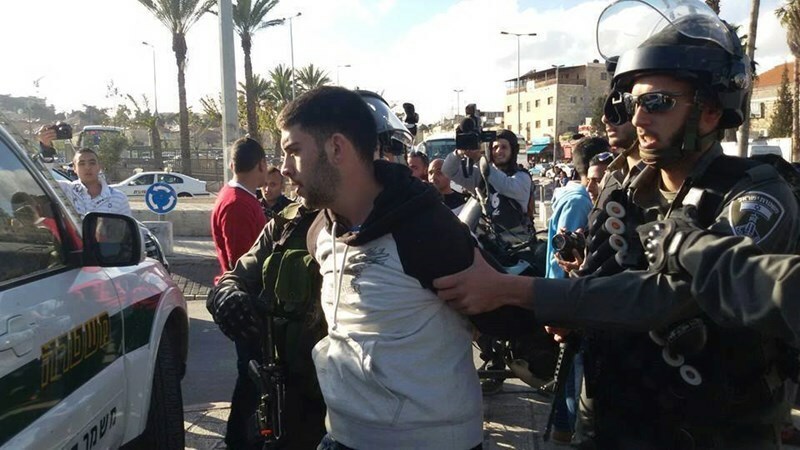 Soldiers also stormed the nearby village of Tura and took Abdullah Qabaha, 21, into custody. 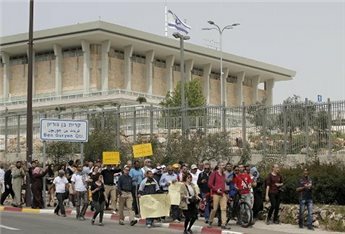 A four-day march led by Palestinian-Israeli MPs, in solidarity with Israel's impoverished Bedouin community, reportedly wound up at Israel's presidency on Sunday. President Reuven Rivlin's office said Palestinian representatives delivered a report on the hardships faced by Bedouin villages to his wife, Nechama, as the head of state was in Singapore for the funeral of its founding father Lee Kuan Yew. She would hand over the report to Rivlin upon his return, according to AFP. Israel's top Palestinian MP, Ayman Odeh, began the 100-kilometer march on Thursday, with several dozen supporters, saying their aim was to put a spotlight on the "human misery" faced by the Bedouin community. The march started in the village of Wadi al-Naam, near the southern Israeli city of Beersheba, but not recognized by the authorities. Odeh has pledged to secure formal recognition for more than 40 Bedouin villages which have no running water, are not connected to the electricity grid and lack basic infrastructure because of their unrecognized status. He visited several of the largest villages on the march to Jerusalem. Around 260,000 Bedouin live in Israel, more than half in unrecognized villages without utilities. Many live in extreme poverty. The Zionist lie: “A land without a people for a people without a land” has always been the reason behind the Palestinians suffering. Whether in Jerusalem, West Bank, Gaza Strip, occupied lands of 1948, and diaspora, Palestinians have paid the heaviest of prices to Israeli terror and land grab. Palestinians everywhere commemorate the Palestinian Land Day in plain refusal of the Israeli judaization attempts that aim at expelling the Palestinians from their lands. 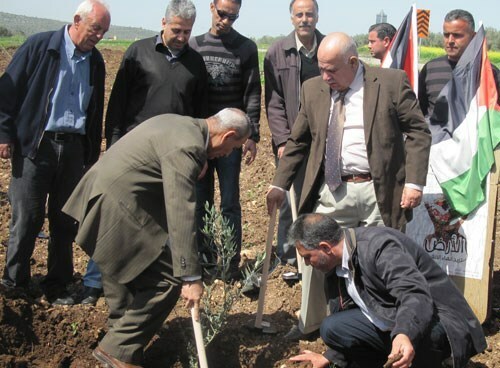 On Monday, March 30, 2015, a series of events organized by the High Follow-up Committee of the occupied lands of 1948 were launched, including marches, sit-ins, and lands planting. 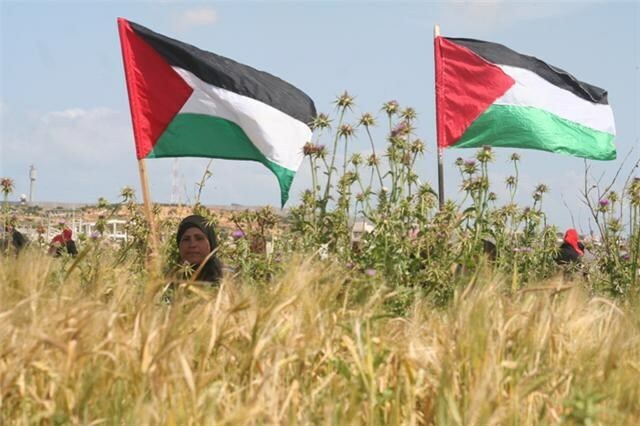 Land Day is a milestone in the history of the Palestinian resistance as Palestinians keep a tighter grip to their ancestors’ land and their adherence to their Palestinian identity despite the suppression and tyranny of the Israeli occupation. On March, 30, 1976, six Palestinians were killed and hundreds were detained. In the north of the occupied lands of 1948, the people of Sakhnin City are still recalling the details of the Land Day in which Israel killed six Palestinians in 1976. Nasri Hamdan, a Palestinian citizen, said that the anniversary sharpens the will of every Palestinian in the occupied lands of 1948 to refuse Israelization and to renew clinging to the land and sacrificing for it to confront the occupier’s judaization attempts. Land Day also coincides with Prawer plan of displacement, which rules transferring 800,000 acres of the Negev Bedouins’ lands to the property of the Israeli government. As part of the plan of judaization and settlement in the Negev and Galilee, Prawer plan is an attempt to settle 300,000 Jewish settlers in the Negev. Thousands protest 1976 land confiscation, vowing to protect land and criticize decision not to declare a general strike. Thousands of Israeli Arabs participated in across the nation Monday marking the 39th Land Day – an annual day commemorating Israeli confiscation of Arab lands. 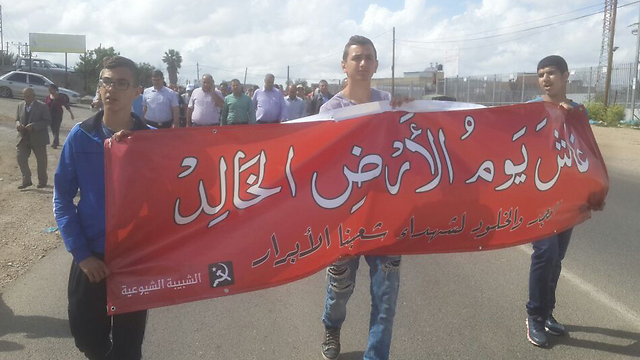 Demonstrations took place in Deir Hanna, in the Lower Galilee, and Rahat, in the south. The demonstrators waved Palestinian flags and urged the continuation of the struggle against "land confiscation and tearing down of houses in the Arab sector." Land Day marks the anniversary of the Israeli government's decision in 1976 to confiscate 20,000 dunams of land from Arab citizens in the Galilee. Protestors shouted slogans like "We will sacrifice our lives for the martyrs" and "We will protect our lands". Many sharply criticized the High Follow-Up Committee for Arab Citizens of Israel, which decided not to declare a general strike in the Arab sector to mark the day. Although there was no strike, many parents kept their children home from school. According to reports, about 70% percent of Arab students did not go to classes. "It doesn't feel like Land Day, because there's no strike," said Mahmoud Masaruwa, a resident of Wadi Ara. "Where is the Joint Arab List? They didn't do anything. If this had to do with the Knesset elections, we would see a different reaction. It seems like Land Day has become unimportant." MK Ahmad Tibi of the Joint Arab List, who participated in the Rahat demonstration, said: "67 years have passed since the founding of Israel and there is still no equitable allocation of land, there is continued expropriation from Arabs in favor of the Jewish majority, there is a lack of planning and construction, there are unrecognized Bedouin villages and a threat called the Prawer Plan. "The matter of revenge continues to be the main obstacle to equality for the Arab minority. Land Day symbolizes more than anything the exclusion, complacency, and discrimination against the Arab minority, which will continue to fight for its basic rights. We bow our heads to the martyrs who fell in '76 and we keep making their voices heard." At least 21 Palestinians were arrested by the Israeli army and police in the West Bank and Occupied Jerusalem on early Monday morning. 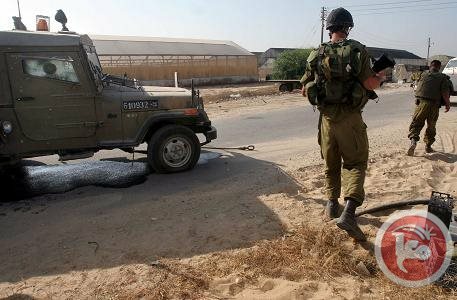 The Israeli Channel 7 quoted the army as claiming responsibility for the apprehension of 21 Palestinian citizens on allegations of involvement in anti-occupation activities. The Israeli occupation forces (IOF) reportedly abducted 11 Palestinians form Ramallah’s town of Abwein and another citizen from Burin village, south of Nablus city. A similar assault in Nablus’s town of Qaryout resulted in the abduction of the Palestinian ex-prisoner Nidhal al-Bawm after a heavily-armed IOF patrol cordoned off his family home and blew up its entrance gates. 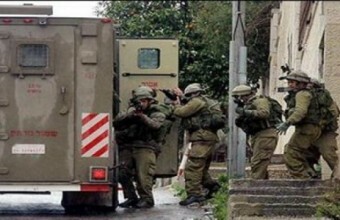 Eye-witnesses said the IOF soldiers wreaked havoc on the house and assaulted its inhabitants, stirring up a state of panic among children and women. The IOF soldiers forced the captive out of his family home, blindfolded and handcuffed, and dragged him to an unidentified destination. Two Palestinian youngsters, in their twenties, were also captured in al-Khalil, sources based in the city further reported. A PIC correspondent quoted Jenin locals as stating that the IOF troops stormed al-Kharouba neighborhood via six army jeeps and kidnapped the 21-year-old Ashraf Hilal Shata moments after they scoured his family home and ravaged it. The campaign culminated in the abduction of six Palestinian civilians from Jerusalem’s Old city and Silwan neighborhood during a series of home break-ins launched by the IOF. Such an arbitrary mass-arrest campaign comes to mar the celebrations of the 39th anniversary of the Land Day marked on March 30 every year. Earlier on Sunday, the Israeli occupation authorities released the Gazan detainee Sami al-Hafi, 35, after he had served a seven-year prison-term. At least 7,000 Palestinians, including 450 Gazans, are incarcerated in the Israeli occupation jails, where they have reportedly been subjected to dire detention circumstances and ongoing psycho-physical torture. 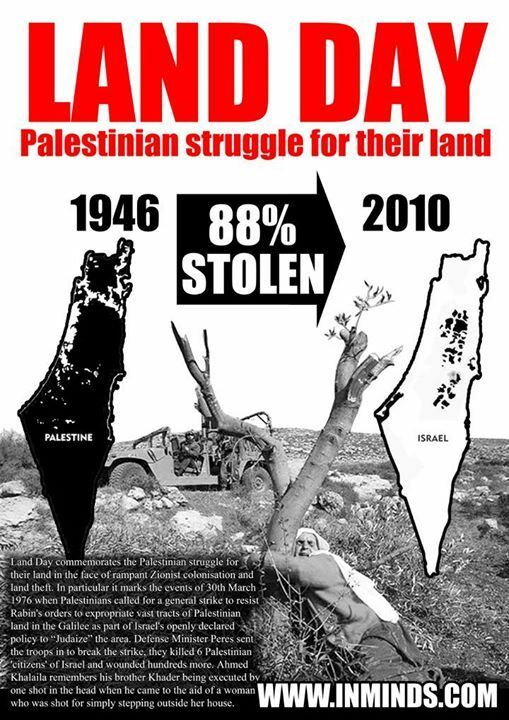 What is it that Palestinians commemorate on Land Day? On 30 March 1976, thousands of people belonging to the Palestinian minority in Israel gathered to protest Israeli government plans to expropriate 60,000 dunams of Arab-owned land in the Galilee. In the resulting confrontations with Israeli police, six Palestinians were killed, hundreds wounded, and hundreds jailed. In the intervening years, those events have become consecrated in the Palestinian memory as Land Day. After years of military rule and political docility, Land Day 1976 was the first act of mass resistance by the Palestinians inside Israel against the Zionist policy of internal colonialisation, a systematic process of expropriation that had reduced Palestinian land ownership from around 94 per cent of all territory in pre-1948 Palestine to less than three per cent in what is now considered to be Israel. Today, Palestinian Arab citizens of Israel comprise approximately 19 percent of the total population of the country, numbering close to 900,000. They live predominantly in villages, towns, and mixed cities in the Galilee region in the north, the Triangle area in central Israel, and the Negev desert in the south. They belong to three religious communities: Muslim (76%), Christian (15%), and Druze (9%). In 1947, the Palestinian Arabs comprised some 67 percent of the population of Palestine. During the Arab-Israeli war of 1948, approximately 780,000 of the pre-1948 Palestinian population fled or were expelled to the fate of becoming refugees in the Arab states and in the West. Of the 150,000 Palestinians who remained in the new Israeli state, approximately 25 percent were displaced from their homes and villages, and became internal refugees. As a result, the Palestinian Arab population in Israel found itself disoriented and severely weakened. From 1948-1966, the Palestinians in Israel lived under a military administration, applied only to them, despite the fact that they were declared citizens of the state in 1948. Military rule severely restricted their fundamental civil liberties, including freedom of movement, speech, and association. Up until 1965, attempts to organize the Arab community in Israel in pan-Arab movements were forcibly stopped and these associations outlawed. The Israeli authorities also massively confiscated Palestinian-owned lands. By 1993, over 80 percent of the lands owned by Palestinian Arabs living in Israel had been confiscated and placed at the exclusive disposal of Jewish citizens. Israel never sought to assimilate or integrate its Palestinian citizens, excluding them from public life while practicing systematic discrimination in all fields. Successive Israeli governments maintained tight control over the community, attempting to suppress Palestinian/Arab identity and to divide the community within itself. To that end, Arabs are not defined by the state as a national minority: rather they are referred to as “Israeli Arabs” or by religious affiliation. In October 2000, Israeli police shot dead 13 Palestinian citizens of Israel, using live ammunition and rubber-coated steel bullets, during street demonstrations which took place in tens of Palestinian towns and villages in Israel. Hospitals and local clinics reported that about 1,000 Palestinian citizens of Israel were injured in clashes with Israeli police. Most of those slain and seriously injured were shot by the police with rubber-coated steel bullets and live ammunition in the upper body. The Israeli police also prevented ambulances from entering Palestinian towns in Israel, and attacked some ambulance drivers. Israeli police arrested more than 400 Palestinian citizens of Israel during the clashes, both demonstrators and passersby. About 90 Palestinian citizens of Israel — adults and minors — have been indicted, and the courts, accepting the prosecutors’ recommendations, have ordered tens of these individuals detained without bail until the end of trial. By contrast, of 300 Jewish citizens arrested, only 10 have been indicted. Hamas's office of refugee affairs has said that the history proved that no racist and fascist occupying force had ever survived even if it had used violence and oppression against other nations. 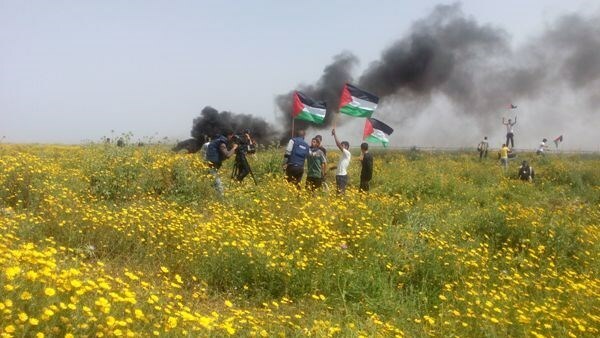 In a press release issued Sunday on the occasion of the Land Day, the office stated that "the Palestinian people have resisted, through all stages of their conflict with the Israeli occupation, all attempts to uproot and displace them from their land and protected their Arab identity." "The Land Day confirms that the racist project of the Zionist occupation cannot converge with the project of Palestine, its land, civilization and history." 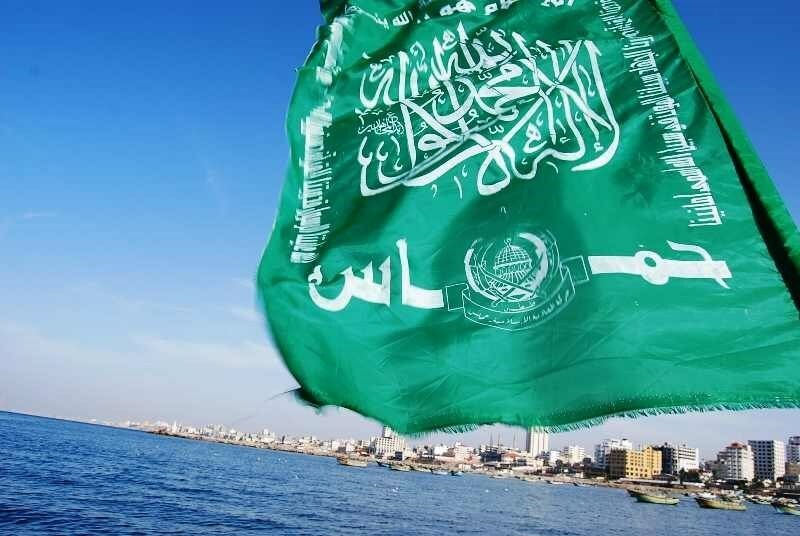 Hamas's statement urged the conferees at the Arab summit in Cairo to necessarily shoulder their responsibilities towards Palestine and support the steadfastness of its people in the face of the occupation, and reminded them of the centrality of the Palestinian cause. The statement underscored that "the Palestinian people can never cede a single inch of their land and will sacrifice everything they possess to protect it until liberating it from the Israeli occupation."